Svederna are a band from Sweden that plays a very raw and melodic form of black metal with some elements of thrash, punk and rock'n'roll and this is a review of their 2018 album "Svedjeland" which will be released on April 20th by Carnal Records. Drum beats start off the album along with some heavy very melodic riffing a few seconds later while all of the musical instruments have a very powerful sound to them and the vocals start out in a shouting fashion as well as the music also brings in a great amount of punk elements. Black metal screams are a very huge part of the music while the tremolo picking and blast beats during the faster sections of the songs gives the music more of a raw feeling along with the songs also bringing in a great mixture of slow, mid paced and fast parts as well as the music also bringing in a great amount of 90's influences and the riffs also mix in elements of thrash and rock music and as the album progresses melodic guitar leads can also be heard in certain sections of the recording and spoken words are also used briefly. 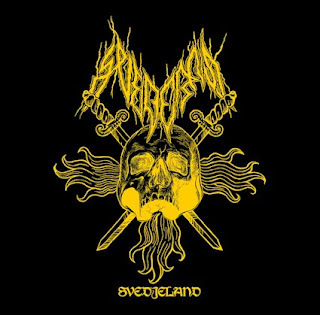 Svederna plays a musical style that is mostly rooted in a 90's era of melodic and raw black metal while the element s of punk, thrash and rock'n'roll gives the music more originality, the production sounds very dark and raw while the lyrics are written in Swedish and cover anti establishment themes. In my opinion Sverderna are a very great sounding old school style black metal group with touches of thrash, rock'n'roll and punk and if you are a fan of those musical genres, you should check out this band. RECOMMENDED TRACKS INCLUDE "Branda Jordens Taktik" "Kulor & Lander" and "Knol". 8 out of 10.